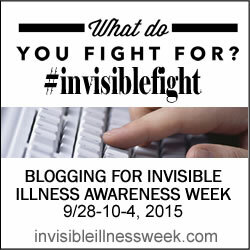 September 28 through October 4 is Invisible Illness Awareness Week. Started in 2002 by Rest Ministries' founder Lisa Copen, it's an annual week devoted to raising awareness and supportive encouragement for the many around the world who are dealing with invisible chronic illnesses. Last year was the first time I had heard about it, and since then I've been thinking about this year's initiative. What I look the most forward to aren't the facts, although those are helpful for educating myself and others about chronic illness. But it's really the personal stories that hit me, putting human faces and names to the seemingly-anonymous figures floating around in medical journals and in the media. And knowing a bit more about the struggles of those around me makes my own feel lighter. This year's theme is My Invisible Fight. So, what is your fight? Or is your friend, family member, neighbor, colleague, labmate, or classmate in the midst of a fight that you might not know about? Maybe this is the time to find out -- or at least be willing to serve as an open ear and heart. You never know who might need it. Check out the website, the Facebook page, and the blogs dedicated to the cause. I hope to be blogging next week to share a bit about my own fights. See you then!